Turkish President Recep Tayyip Erdoğan is scheduled to visit President Donald Trump at the White House on May 16. The main topic of discussion will be the situation in Syria - primarily the ongoing fight against the Islamic State in Iraq and Syria (ISIS). 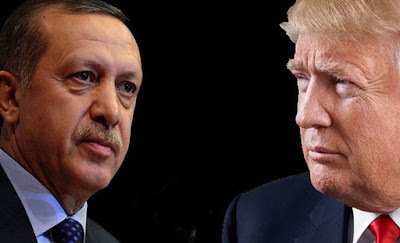 One of Mr. Erdoğan's reasons for the quick and short trip to Washington is to request President Trump reconsider the American decision to provide more arms to the Syrian Democratic Forces (SDF). The SDF is composed of Syrian Arabs and Kurds operating in northern Syria against ISIS - they have been by far the most effective ground force combatting ISIS. The Kurdish component of the SDF is the People's Protection Units, in Kurdish Yekîneyên Parastina Gel‎ (YPG). The Turks maintain that the YPG is nothing more than the Syrian branch of the outlawed Kurdistan Workers' Party, in Kurdish Partiya Karkerên Kurdistanê (PKK). The PKK has been designated as a terrorist organization by not only Turkey but also the United States, NATO and the European Union. However, the United States does not consider the YPG to be part of the PKK. To the Turks, they are one and the same. Since August 2016, the Turks have been supporting a major Free Syrian Army (FSA) incursion into northern Syria codenamed Operation Euphrates Shield. Turkish support has included airpower, armor, artillery, reconnaissance, logistics and special forces. Several Turkish troops have been killed by ISIS, including two captured soldiers who were burned alive. The Turks had hoped that the FSA force would eventually make its way south and east into Syria via al-Bab, Manbij and on to al-Raqqah. Unfortunately, as the FSA force moved into Syria and fought successfully against ISIS, the Turks opted to have the FSA engage in offensive operations against the SDF as well as ISIS, claiming that the SDF's YPG component was part of the PKK. In an unusual but not unheard of arrangement with the Syrian Army - and their Russian backers (some would say masters) - the SDF allowed the Syrian military to move north into the Manbij area and effectively block the advance of the FSA and their Turkish Army support troops. Russian and U.S. troops monitor the agreement in close proximity to each other. This map shows the current situation. Perhaps Turkish intelligence has failed to brief Mr. Erdoğan that the FSA forces he wants to liberate al-Raqqah are effectively blocked by the SDF and Syrians. The FSA force is at least 60 miles away from al-Raqqah, but in reality about 100 road march miles away. They are not in a position to mount an attack on al-Raqqah. In fact, Euphrates Shield forces no longer have a front line with ISIS. The Turkish decision - I assume Mr. Erdoğan was involved in making the decision - to attack SDF positions while both the FSA and the SDF were fighting ISIS has probably eliminated any chance that there will be cooperation between the two anti-ISIS forces. To illustrate why this decision was a major blunder, let's look at the Turkish armed forces' proposals for the FSA Operation Euphrates Shield force to mount an assault on al-Raqqah. First, the Turks attack U.S.-backed forces, then demand the United States arrange for them to take the lead in the attack on al-Raqqah. The Turks have proposed two options. 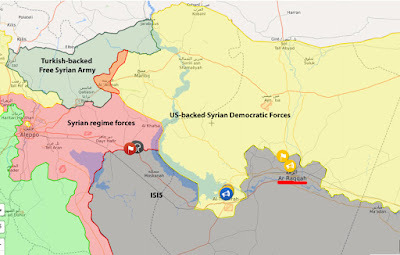 As seen on the map, one option is to have the United States arrange with the SDF - the same force the Turks have been attacking along the entire length of the Syrian border - a safe passage corridor from the Turkish city of Akçakale (opposite the Syrian city of Tal Abyad) south 50 miles to al-Raqqah. The Turks would have to move the entire FSA force from current positions in the al-Bab area back to Turkey, then east to Akçakale, cross the border into SDF-controlled Syrian territory, and finally move to attack positions near al-Raqqah. These positions have been secured by the SDF at great human cost. I do not believe the SDF will countenance a Turkish-backed and supported FSA force moving through their territory. The Turks have poisoned those waters by the airstrikes and artillery attacks on SDF units over the last few weeks. The second option is less challenging politically, but might be logistically impossible. Note the twisted ribbon-like arc to the south of the FSA positions ending near al-Raqqah. The twisted ribbon represents an airborne/heliborne assault. If - big if - the United States wants to placate an important NATO ally despite its unhelpful actions, it could offer to try and coordinate some FSA participation in the coming attack on al-Raqqah. A small air assault might be the vehicle to do this. However, this would reward the Turks for their petulance. - Mr. Erdoğan, your FSA supported forces are bottled up near al-Bab, almost 100 miles from al-Raqqah. - Your air and artillery attacks on SDF forces, which are backed by my forces - including U.S. troops on the ground - have obstructed progress in the fight against ISIS and wasted valuable time. 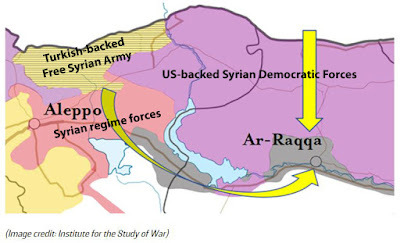 - The Kurds are now only about three miles from al-Raqqah and pressing the attack. - Time is of the essence - we believe ISIS is planning attacks on the West, and the people of al-Raqqah deserve relief from ISIS rule. - Once al-Raqqah falls, there may be a role for the FSA, but I do not see a role for them in the assault. For more detailed coverage of the Turkish experience in northern Syria and Erdoğan's resulting petulance, see my earlier articles: Syria - has Turkey been marginalized and the Americans thrust into the fight? and Turkey and the fight against ISIS - whose side are you on?